Fetch, tug, and play all day long with Pet Factory’s Logical Pet premium dog toys! Entertain your dog for hours playing solo, with a pet buddy or human friend. Quality Pet Factory Logical Pet dog toys offer something special for every dog. Interactive toys build relationships and keep your pup entertained and busy while promoting exercise. Chew toys promote normal chewing behavior and provide the added benefit of keeping their teeth clean and jaws strong for an enhanced quality of life. There are many considerations when buying dog toys and accessories. You’ll want to find something that is colorful, entertaining, durable, and safe. Perhaps you are looking for something new or just want to replace an ol’ favorite. 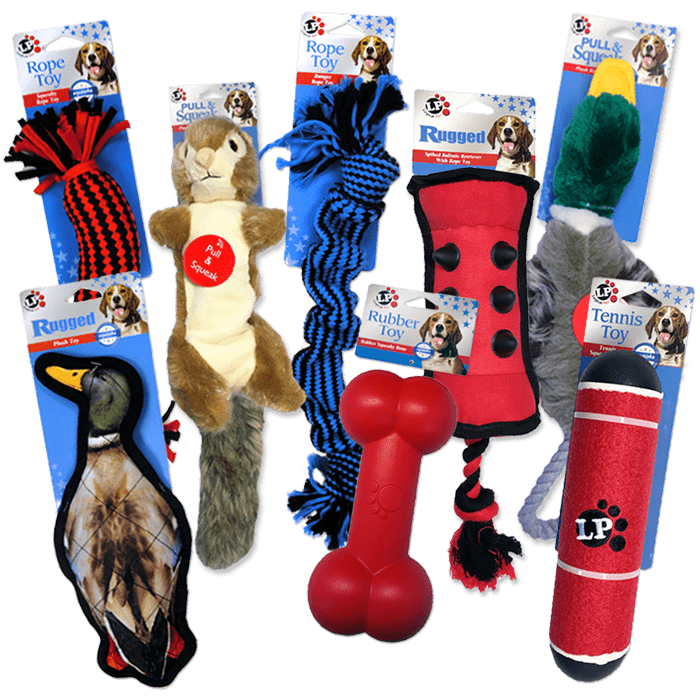 Dog toys come in a wide variety of shapes, sizes, and materials for every pet. Consider your dog’s personality and unique needs. Do they like to chew, pull, retrieve, shake, or just cuddle up with their toys? Whatever their play style, Pet Factory’s Logical Pet premium dog toys fill the bill. Look for interactive plush toys with exciting squeaker technology to enhance playtime fun. Logical Pet has a new line of Pull & Squeak and Shake & Squeak plush toys with large squeakers that dogs really love. Bright and colorful plush will be a big hit. Logical Pet makes a variety of cute animals – multi-colored parrots, ducks, squirrels, rabbits, frogs, and even bears. Logical Pet also carries top-selling traditional patterns and shapes. Keep safety and durability in mind. Look for plush toys made with premium tough materials that are built to last. All of Logical Pet plush toys are ruggedly constructed with reinforced seams for long-lasting fun with your best friend. Look for rope toys that promote interaction between you and your best friend. A strong, quality rope toy will enhance and extend your game of tug-of-war. People and their pets both enjoy rope toys in fun shapes and patterns and bright colors. Nothing says “fun!” like a colorful new rope toy. You can find Logical Pet rope toys in many fun shapes and colors for dogs of all sizes. Remember to focus on quality when shopping for rope toys. They take a real beating and can wear out quickly if the materials are inferior. You’ll get more value for your money if you buy rope toys made of premium materials. Did You Know? Rope fibers floss dog’s teeth as they chew and play. If you’re looking for a tough toy for an active dog, look no further than Logical Pet rubber toys. Our quality, rugged rubber material is practically indestructible for long-lasting value. Dogs enjoy colorful, cheerful rubber toys in fun shapes and sizes. Look for colorful rubber toys in fun shapes – footballs, bones, and barbells are a blast for unpredictable bouncing action and crazy play. For added fun and value, look for rubber toys equipped with an exciting squeaker. Your pet will enjoy hours of physical activity and mental stimulation with our Logical Pet rubber toys. Does your dog enjoy a game of fetch? Logical Pet rugged tennis toys are just the thing! Tennis toys combine the benefits of a traditional tennis ball with an exciting hidden squeaker for extra stimulation. Especially appropriate for the sports lover, tennis toys come in many shapes and sizes to suit every dog. Logical Pet carries traditional styled tennis balls as well as bars and multi-ball options. Is your dog a heavy chewer? Look for super-durable Logical Pet Rugged Toys – they are ideal for heavy chewers. For dogs that like to retrieve, our new line of spiked shape toys will be your best bet. Farm and hunting dogs and their human friends will enjoy training activities starring our rugged duck toys. They are perfect for toss and retrieval and will keep your best friend in the game for hours. Quality Pet Factory Logical Pet dog toys offer something special for every dog. Toys are a great gift idea – they’re a fun, low-cost way to recognize or treat your pup. 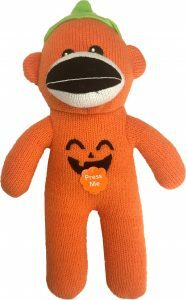 Look for our cheerful interactive plush toys, costumes, and conveniently packaged and labelled beefhide treats – all holiday-themed for Halloween and Christmas gift-giving. This Halloween and Christmas season, stock up on Pet Factory Logical Pet dog toys, accessories, and treats. Look for our line of Happy Howlidays dog toys and accessories – online, at your local pet store, or at national retailers.